Conlon Nancarrow, (1912-1997) was born in Texarkana, studied composition from an early age, (with Slonimsky, Sessions, and Piston privately in Boston) and played jazz trumpet in local bar bands. He joined the Lincoln Brigade and fought Franco's fascists in 1930's Spain, also becoming a member of the Communist Party. Upon his return to the USA, he resumed composition, and associated with other new radicals in the New York scene, including John Cage and life-long friend Elliot Carter. Nancarrow's political leanings gradually attracted the interest of the state, and he was refused a passport upon application in 1940. 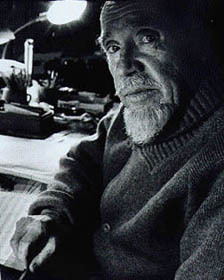 Nancarrow moved to Mexico City, home until his death of heart failure at age eighty four. Early performances of his highly complex work were failures, often due to incompetent musicians, and his attempts to relaunch his compositional career ground to a halt in the (understandably) underfunded and ill-equipped Mexican contemporary music scene of the day. Frustrated by years of indifference and incompetence, Nancarrow withdrew from 'normal' musical circles, and, inspired by the writings of Henry Cowell, ordered an Ampico Reproducing Piano and the required hole-punching equipment for the pianola rolls. The player piano became his sole musical outlet, and he wrote over 50 'Studies' exclusively for the mechanical instruments until a sudden explosion of commissions in the 1980's and 1990's saw live musicians once again tackle his formidably polyrhythmic works. His history of writing impossible music ('post-performer music') did not fade, and one of the high points of his late-period recognition was a series of collaborations with instrument builder Trimpin, whose computer-controlled percussion ensembles were the ideal realisation of some of Nancarrow's most challengingly extreme scores. Trimpin's work with Nancarrow was an appropriate culmination, recalling Nancarrow's own 1940's attempts to build mechanical percussion instruments, and also maintaining the grinning dadaism of the player-piano works, (one of Trimpin's ensembles is an 'orchestra' of tuned wooden shoes). As has been remarked by Nancarrow scholar Kyle Gann, Nancarrow had perhaps the strangest career of any known composer. It was strange in a subtle, dadaist way, not the brash 'craziness' of rock or jazz figures (or indeed figurines). Whilst we often laud the achievements of great 'performers', Nancarrow's music has remained hidden, obscure, like the patient and diligent character who produced it. Given the method and manner of his work, it is no surprise that where he is considered at all, he is considered another unusual, even brutal 'American original.' Nancarrow's music is, however, perhaps some of the most significant of the century. What kind of music would prompt Ligeti to rave: "This music is the greatest discovery since Webern and Ives... something great and important for all music history! His music is so utterly original, enjoyable, perfectly constructed but at the same time emotional...for me it's the best of any composer living today." It is clear that Nancarrow's music remains profound. Ligeti's remark "perfectly constructed but at the same time emotional" is utterly accurate. This fusion of what are elsewhere often aesthetic opposites is the remarkable characteristic of the sum of Nancarrow's music. It is a product of his exploration of polyphony, and polyphonic perception. Nancarrow's limited instrumental means dictated a set sound-world. Although he did occasionally have the hammers inside the pianos modified, in order to achieve a more percussive or mallet-like sound, essentially he dealt with the specific characteristics of the pianola: metallic, sharp and thinly reverberant. However, he somehow managed to coax a remarkable depth and breadth of sound from the aged machine(s). It has been speculated that the room in which all original recordings of the 'Studies' were made significantly affect this depth. Early (for instance 1970's) recordings are overwhelmingly dynamic, while the later WERGO recordings are more close-focused, but less dense. The sound breadth, however, is heard in the ear. One of the more interesting examples of immediate textural polyphony is 'Study no. 20.' Nancarrow employs small, repeated motifs in different registers, gradually building to a spinning plane, with no specific moment of climax. His gentle introduction of phrases, and use of repeated notes at specific octaves, with attendant specific dynamics allows the listener to latch on to small relations, small connections. These structures gradually vary, and new echoes are heard in lower registers. Smaller and smaller changes occur, growing away from the abstract introduction. But the ear (or rather the brain) 'remembers' key notes, key phrases. When new voicings appear, we continue to hear the original phrases... as if the music remains bouncing around inside the piano and then off the walls. 'Study no. 20' is also a clever exploration of duration-perception, with Nancarrow playing with the ear's sense of 'expectancy.' Again where we 'heard' notes from before, now we 'hear' notes filling in 'registeral gaps', (bass-lines seem to continue, chordal events hang in the air). Nancarrow's music is concerned with this complex game of perception, setting up expectations, or producing useful and intriguing event-sequences from seemingly disparate and coolly abstract elements. These perceptual explorations function because of the unique space Nancarrow constructs. And the main demarcations of this space are his unique approaches to rhythm, harmony, and style. Some of the 'Studies' employ not only odd-time signatures, but also dense polyrhythms and shifting tempos. 'Study no. 37' for instance employs twelve different tempos for twelve different voices. Other studies use strongly contrasting but interlocking phrases, usually with the unifying central pulse implied but never stated. Even in pieces that use few voices (or 'parts'), the rhythmic complexity is intense, for instance 'Study no. 18.' But there remains a unique 'groove' to it all, a jazzy, almost flamenco-like syncopation, evidently due to Nancarrow's affection for jazz trumpet (and jazz pianists such as Art Tatum and Earl Hines) and the music of his now native Mexico (he became a citizen in 1956). Harmonically, Nancarrow retained a constructivist interest in bitonality and polytonality, (few of his works can be called tonal), and a serial 'Study' does exist. However, with the method of the player-piano focusing so much of his attention on repetition, unusual harmony or melody became less of a concern (remember that few of his studies last more than 5 or 6 minutes, and even that could take a year to write and hole-punch). Kyle Gann reminded me that, like Cage and Partch, Nancarrow was forced to 'jump-ship' in the post-war / post-serial harmonic clearing ground. New forms of experimentation were required, not the formalised predictability of serialism. His harmonic experiments, like their rhythmic counterparts, force a new attention to interrelated events, but they also allowed Nancarrow to indulge his jazz fantasies. Gann: "I think Conlon started off with a case of "jazz envy." The early studies give the impression that he wanted to make jazz, but didn't have the right training to do it in the conventional way. He played jazz trumpet, but didn't have the personality to put together a band, nor did his musical education prepare him to write chord changes. The player piano gave him a way he could make pseudo-jazz, and justify it by including things too fast and complex for any jazz pianist to ever achieve. Besides, jazz was a more exciting direction than the serialism music had been moving toward when Conlon was still in the U.S."
The true quality of Nancarrow's harmonic sensibility is to be found in the 'fully-formed' sound of his phrases. He writes with the authority and velocity of a jazz soloist, playfully orchestrating the group around his line. He was able to incorporate the power of atonality and the evocative logic of melody, and he even managed to incorporate noise (cluster chords, mistake noises) and mock-effects (some pieces use ultra-fast repeated notes like a primitive kind of echo). His harmonic and orchestrational skill is perhaps most evident in the later live-musician-realised pieces, which draw out the clever touches that often hidden by the potent shock of the pianola-only recordings. Great 'Studies' like 'no. 7' finally reveal their big-band heritage, while Nancarrow's late works for musicians like 'Piece no.2 for Small Orchestra' confirm his undiminished awareness of actual instrumental interplay. Nancarrow's early pieces are affective, even rather touching ('2' and '6' are astonishingly beautiful pieces of music, with hints of, dare I say it, sentimentality). But Nancarrow's late work remains the most intense, authentic and fully realised. It seems that as musicianly realisation seemed less and less likely (the early 'Studies' occasionally sound as if they were stop-gap pieces), he began writing works that more fully utilised the idiosyncrasies of the player piano. Some of those early Studies were arranged for the Ensemble Modern (best known for their work on Zappa's Yellow Shark) by Ivor Mikhashoff, (with orchestrational suggestions from the composer). Mikhashoff noted of the later work "they were conceived directly for the player-piano, presenting melodic lines that extend over six or seven octaves, beyond the range of a single instrument, and rhythmic complexities that are unconductable". The later works deal with deeper issues than simple 'impossibility.' There are works for multiple player pianos, both synchronised and unsynchronised, works with very complex levels of polyrhythmic temporal ratios, works with the same section being played simultaneously at different tempos, etc... They incorporate unique touches, such as monstrously large chords, ludicrously fast glissandi, impossibly accurate tuplets and repeated lines. The pianola's dextrous rendition of 128th notes mocks mere musicianship. But in dense works like 'Study 40a' or '41c,' these obscure effects zoom past the ear then slide into a sudden reference to a bebop phrase. Giant chords pound out passages of atonality then logically evolve into a flamenco-esque progression. Touches of jazz, flamenco, dixieland, Stravinsky and blues continually out of his music. Why is this so? Again, it returns to ideas of polyphonic perception. For all the ultra complexity, much of the music is rooted in a personal, referential language, since all of his experimental methods were aimed at exploring polyphonic perception, not as ends in themselves. The composer James Tenney described Nancarrow's work as employing an 'event polyphony.' Thus while there is constant simple polyphonic activity, for instance just two interlocking lines, ultimately there is a polyphony of passages, of structures, of compounds of events, and perhaps even a stylistic polyphony. Nancarrow drew in disparate elements and evolved a method that logically and fluidly span out a transformative music. He does not use style as a support, but instead subsumes those personally resonant references (jazz trumpet, barrelhouse piano, flamenco-like strums) into a fully developed and unique music of his own. It is a music that can only increase in significance. The hole-puncher required to perforate pianola rolls was an old and tough mechanism. Adult male visitors to the Nancarrow home report struggling to even make the usually automatically-driven device even budge. But Conlon Nancarrow spent almost his entire adult life manufacturing these amazing rolls. His patience produced a hugely muscular forearm, and a body of work of astounding intensity and importance.